As their ride home arrived and sounded its foghorn, the commuters who were lined up at Rowes Wharf smiled in anticipation. The men and women clad in business suits and toting briefcases knew that while their co-workers battled a tide of elbows on trains and endured stop-and-go traffic on the highway, they would be slipping off their commuting shoes, opening a good book, and possibly cracking open a beer. Each day, hundreds of people walk up a gangplank and onto an MBTA ferry that arrives in Hingham in about a half-hour. 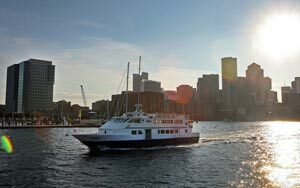 The trip is faster and more relaxing than getting home by train or car, and even more enjoyable in the summer, commuters say, when they can bask in the warm evening sun on the ferry’s dual decks. As the downtown skyline receded in the late afternoon sun Thursday, men loosened ties and tucked their chins to their chests for a half-hour nap. Women eased out of pumps and deposited purses on the rows of benches on the boat’s lower deck. Many made a beeline for the bar. The MBTA frowns on food or drink on trains and buses. The ferry has no such stigma. As the boat putted toward Hingham, the hiss of a beer opening and the clink of bottle caps coming off Corona Lights punctuated the rhythmic churn of the boat’s propeller. The ferry, which costs $6 each way, is by no means a party boat. Bartender Susan Lifrieri, 45, said she serves about 15 beers and 15 cocktails during peak rush-hour traffic of about 250, but the chance to unwind with a drink during the commute is hard to pass up. After they left work at the law firm Goodwin Procter, Daniel White, 32, and Erin Michael, 29, settled in on the rail near the prow of the boat, beers in hand. “You’re almost sorry to see the dock,’’ Michael said, adding that Thursday’s return voyage marked her first full day of commuting by boat since she moved to Hingham. In the winter, the cold wind off the water keeps passengers inside, White said, but that makes the ride no less relaxing: CNN plays on televisions, and Lifrieri serves coffee, cereal, and milk. Bikes are always allowed, as are pets. When McLaughlin boards the boat in the morning, bound for the North End, so does golden retriever Amos. The dog bounds up the gangplank to strategically slump his paws and head over the railing, creating convenient head-petting access for every commuter. “How many other forms of public transportation let you bring your pet?’’ asked McLaughlin, chief executive of the travel company Smart Destinations. Boats from Hingham to Boston can be packed as early as 6 a.m., as workers head into the office early. But the ferry is rarely crowded in the evenings, and almost never with commuters. Five people rode to Boston after the Nora Vittoria turned around and headed back into the city at 6:35 p.m.
“My husband is stuck in Red Sox traffic right now, and we’re joking that we’ll get to Boston, have dinner and get back before he does,’’ said Suzanne Cohoon, 44, of Plymouth, who was taking her daughters, son, and niece to Faneuil Hall for dinner, ice cream, and a stroll on a warm summer night. Like the morning commuters with a change of shoes, her son came dressed for his trip, in a powder-blue Scooby-Doo life vest. Cohoon said that next year she might let her teenage daughters Elizabeth and Katie make the trip to Boston themselves.